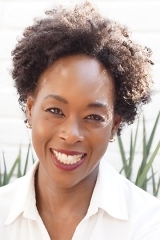 Margot Lee Shetterly grew up in Hampton, Virginia, where she knew many of the women in Hidden Figures. She is an Alfred P. Sloan Foundation Fellow and the recipient of a Virginia Foundation for the Humanities grant for her research on women in computing. She lives in Charlottesville, Virginia. I love biographies, in print and on screen, and I’m a big space nut. Until recently, my favorite space book was A Man on the Moon, by Andrew Chaikin, and its accompanying miniseries From the Earth to the Moon (1995, HBO), but after reading Hidden Figures that book has been edged into second place. This book biography, it’s history – herstory – it’s about culture and society and the way white and black America are still incredibly different even though they have many similarities, but it’s also a story about math and physics, and how those things help us to create our dreams. 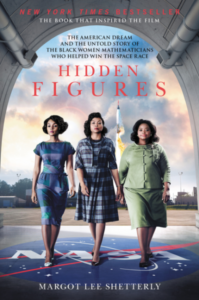 Dorothy Vaughan, Mary Jackson, Katherine Johnson and Christine Darden were mathematicians in the early days of NASA’s space program. Without them, John Glenn would never have successfully orbited Earth, and Apollo 13 would never have come home, but those are only two big events in a series of many, many smaller events. These women, Dorothy, Mary, Katherine and Christine, did the math to make that work. But they weren’t mere math geeks. And this book shows that. It shows that they had lives and homes and families, and all of the usual conflicts that working woman have when choosing between career and family. It shows their similarities, and their differences, and it does it in a way that – even at it’s ‘mathiest’ – is never boring, never dry. 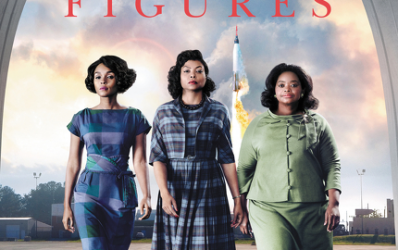 Hidden Figures is a must-read for women and girls who are in, or interested in, STEM fields, yes, but I’d recommend it to space nuts like me, to feminists, to people who want a better understanding of the civil rights movement, and to people who just enjoy reading biographies, because it’s well crafted, compelling, and so, so human. There’s a movie based on this book that is opening in select theaters on Christmas Day, and nationwide in January. Read the book before you see the movie. Goes well with massive amounts of coffee and egg salad sandwiches. According to Mayan tradition, if you whisper your troubles to the Worry Dolls, they will do the worrying instead of you–therefore, it follows that Worry Dolls are the keepers of a great many secrets . . .
On the eve of the end of the world–according to the Mayan calendar–Mari Guarez Roselli’s secrets are being unraveled by her daughter, Lu. Lu’s worry dolls are at-capacity as she tries to outrun the ghosts from her past–including loved ones stolen on 9/11–by traveling through her mother’s homeland of Guatemala, to discover the painful reasons behind her own dysfunctional childhood, and why she must trust in the magic of the legend. Amy is a reformed corporate litigator, founder of SHORTCUTS Magazine, and award-winning author. Her first novel, Lemongrass Hope (Wyatt-MacKenzie 2014) , was a 2014 INDIEFAB Book of the Year Bronze Winner and a National Indie Excellence Awards Finalist. A favorite with bloggers and book clubs, Lemongrass Hope was named the #1 reviewed book in 2014 by blogger, The Literary Connoisseur, and topped several bloggers’ “Best of” Lists in 2015. 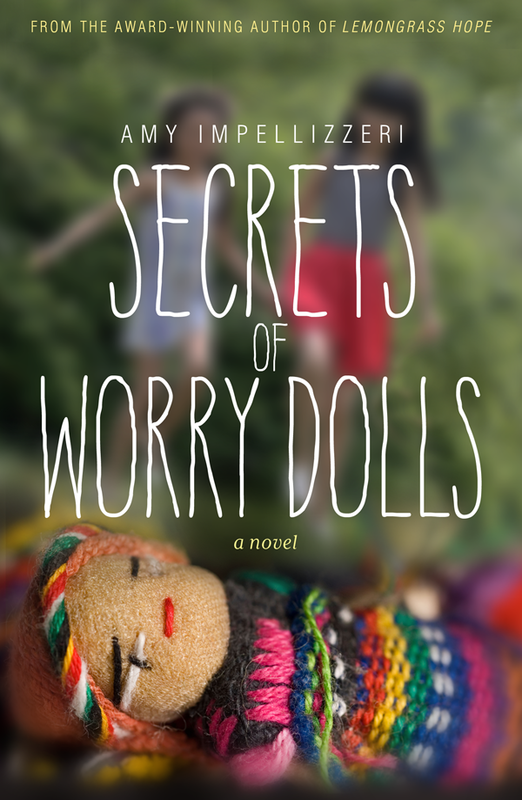 Amy’s second novel, Secrets of Worry Dolls is releasing December 1, 2016 by Wyatt-MacKenzie. Amy is also the author of the non-fiction book, Lawyer Interrupted (ABA Publishing 2015). 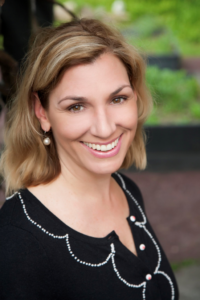 She is a proud member of the Tall Poppy Writers and President of the Women’s Fiction Writers Association. Amy currently lives in rural Pennsylvania with her husband, three kids, and one energetic weimaraner, where she keeps up on all of the latest research confirming that caffeine is, in fact, good for you. I was a bit leery when I was asked to review this book. I’m not a fan of continually revisiting national disasters in general, or 9/11 specifically, but I was assured this story really wasn’t ‘about’ 9/11, so I gave it a chance. In this novel, author Amy Impellizzeri is really giving us two stories, that of Lu, feeling somewhat adrift in her life, and, having come home to find a plane crashed on her block, in need of a new place to stay. Guatemala – her mother’s country of birth – calls to her and she undertakes a journey to make sense of the past, yes, but also to redefine her present. At the same time, we are given the story of Mari before she was Lu’s mother. Told in flashback, these chapters evoke a sudden attraction, a tumultuous romance, and the settling of passion into comfortable love. It’s a rich and earthy peek at the near-past, colored by the lens of memory, and I found Mari’s chapters to be incredibly lyrical. The real artistry, I feel, comes from Amy’s ability to weave this mother-daughter story into a cohesive whole. At times the alternating chapters feel like a dialogue, at other times melody and countermelody, but the entire novel was compelling and ultimately satisfying, full of truthful emotional moments that ran the gamut from hurt, anger, and fear, to self-deprecation, humor, and enlightenment. I want to make special note of two of the unifying elements of this book. First the worry dolls of the title. I’ve had such a box (mine was pink, I think) of tiny dolls, but when I didn’t I told my troubles to the dog, or my stuffed animals. The practice is a nearly universal one, I think, and its one of the touches that made this story so special. I also liked the use of the end of the Mayan calendar – remember how so many people panicked about that a few years ago? In this author’s hands, it wasn’t just a clever plot device, but an apt metaphor for childhood and parenthood. One cycle ends, another begins, and the Great Wheel spins ever onward. Goes well with Quesadillas with sauteed rosa de Jamaica (hibiscus), and a cold beer. 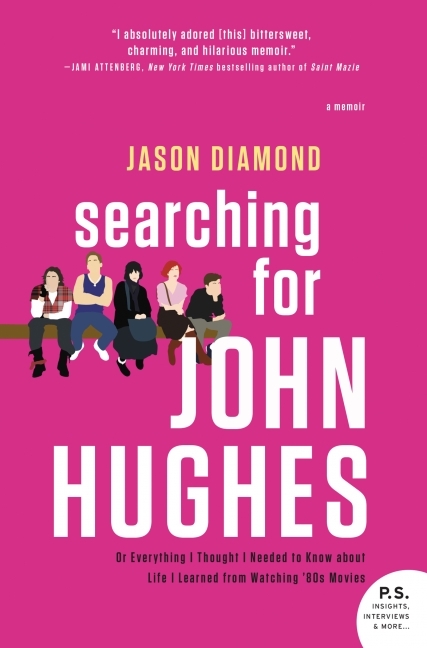 For all fans of John Hughes and his hit films such as National Lampoon’s Vacation, Sixteen Candles, and Home Alone, comes Jason Diamond’s hilarious memoir of growing up obsessed with the iconic filmmaker’s movies—a preoccupation that eventually convinces Diamond he should write Hughes’ biography and travel to New York City on a quest that is as funny as it is hopeless. Like the author of this memoir, Jason Diamond, I grew up on John Hughes movies. Molly Ringwald and Ally Sheedy were my virtual best friends when I was a teenager, and while I never lived in Chicago or New York, I completely understand the feeling that comes from seeing the place you live depicted in a movie (thank you Kevin Smith for making people aware that Highlands, NJ is a place). I always feel a bit weird about reviewing memoirs, because I feel like I’m judging the person, and not their story. 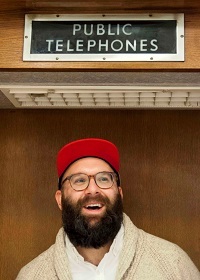 In this case, I really enjoyed the story – the journey that Jason took from cupcake bouncer to witty and read writer. I also enjoyed Jason’s writing style. 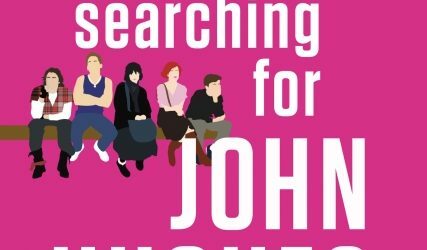 I was completely unfamiliar with his work before I read Searching for John Hughes, but his ‘voice’ is so engaging, with a good balance of wry wit, self-deprecation, and frank observation, that I’m eager to go find his stuff at Rolling Stone and read every word. Ultimately, this is a memoir that will speak to anyone who is considering a major creative endeavor, who hates their current job and wants to find something fulfilling, or who grew up on movies like Pretty in Pink and wants to recapture the feeling of seeing those films for the first time. It’s a compelling read, a fast read, and one I’m really glad I got to experience. Goes well with a cupcake (but please, chocolate, not double vanilla) and a perfect cappuccino.